After such a great string of weather, this week has been a rude awakening as to what’s reality, and what’s in store these next several months. It’s time to hunker down and no better way than with a bowl of soup. I’ve never, ever been a big fan of Split Pea Soup, but the story and this recipe changed my mind, and I hope it will do the same for you. Last year I had sausage on-hand , this time around I did not, but wished I had. Sausage, after all, makes everything better! Take the Bone from a Smoked Ham that you’ve devoured. Smoked Turkey Legs work just as well. Put it in a large soup pot and cover with chicken broth. Add some rough cut carrots, celery and onions. Simmer the hell out of it for a few hours. Strain the broth. Cool the carcass or bone and peel off any meat. Discard all the other stuff. Clean and slice 3-4 Leeks and saute in a little butter until limp then add to pot. Allow soup to simmer gently until beans are cooked through and have started to thicken the broth. You can actually leave this soup go for a few hours if you wish. Ladle soup over spinach which will cook it slightly. Serve with a rustic bread and some awesome butter. Oh wow this looks really homey and comforting. I think my family will really love this dish. 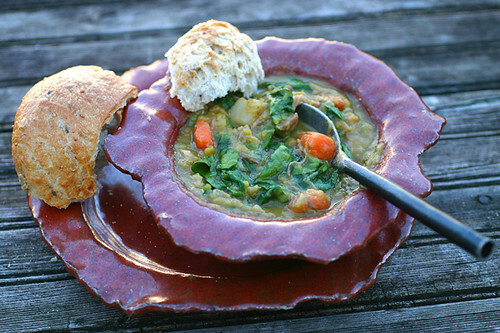 Snert will be my new Split Pea Soup recipe! It looks…and sounds….wonderful! I knew you’d like it, you’re the Split Pea Soup Queen! OMG Mary this looks fabulous! Dad and I both like pea soup but the rest of the family not so much. Maybe the weather will soon allow for soup…. Been so wanting to cook up a pot! Ha – love this post! 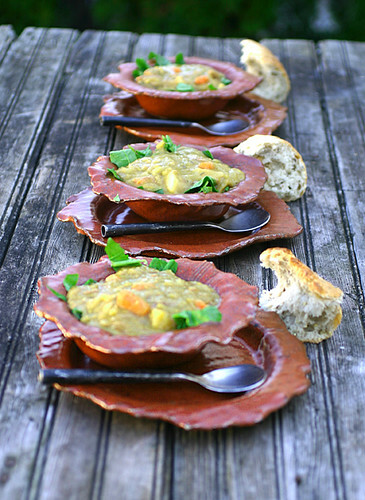 Split pea soup is one soup my husband absolutely loves. I deemed it unedible, even though I never tasted it, because it always looked like baby barf. I made it the other day, and I love it – I made it with smoked ham, but sausage would make it better. The flavor and presentation aside…I’d eat it for the name! Split pea soup is my absolute favorite soup in the world. We called it ooblek in our house. Snert looks gorgeous! Had no idea what I was clicking on, but this looks so tasty and beautiful. Love those bowls, too. wow, i have never heard of snert and i live in Amsterdam! Must ask my dutch colleagues about this one.. Snert!? Really? Never heard that name before! But you caught my eye and wow, snert looks good. It looks filling and healthy. The kind of soup you feel good eating. What a wonderful and unusual soup recipe. Sounds just so inviting and yummy….I am a soup nut. Especially in the fall and winter. Thanks for sharing and your pictures are terrific too. Looks beautiful. 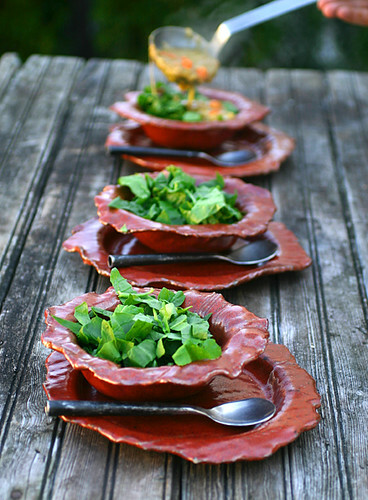 Where did you get those plates/bowls?! Awesome. Thanks Jenna! I made them when I used to be an avid potter.